Fiona Barton’s latest thriller The Suspect is the third book in her popular Kate Waters series. In this novel, we follow journalist Kate Waters as she investigates what has happened to two teenage girls who have gone missing while traveling in Thailand. Kate is an ambitious journalist – she always wants to be the one to get the exclusive and be the first to discover the truth. This case is no different, although it does have the added motivation that it would have her traveling to Thailand. Why is Thailand such a draw for Kate? Because that’s where her estranged son has been living for the past two years. She hasn’t seen him even once in those two years and he rarely ever tries to contact her or his dad and is evasive the few times he has spoken to them. Kate is hoping this investigation will give her the opportunity to check in on him herself and hopefully convince him to come home. Kate decides that getting close to the families of the missing girls is the best way to ensure she is at the forefront and has access as the pieces of the investigation start to form a picture of what has happened to the girls. At first this seems like a brilliant move, but then the investigation takes an unexpected turn that has her regretting her decision to get so close to these families. The Suspect is a suspenseful story that kept me reading late into the night. I knew just based on the novel’s title that a crime had potentially been committed, so as soon as I read that two teens had gone missing in a foreign country, I couldn’t put the book down until I knew what had happened to the girls and who was responsible. The story itself was engaging because the fear of losing a child is a fear that all parents can relate to. Barton does a particularly good job of depicting the two sets of parents and how frantic with worry they are. There are several scenes where they get emotional and lash out at each other, desperately looking for someone to blame. The raw emotions in those scenes felt very real, and it was easy to put myself in these parents’ place and imagine what they were going through. Another aspect of the story that I thought was very well done was the way Barton chooses to present the story from four different points of view – Detective Sparkes (who appears regularly in this series and often works with Kate), so that we get law enforcement’s perspective on the investigation, and of course, Kate so that we also get the media’s perspective. In addition to those two points of view, we also hear from the mother of one of the missing girls and from one of the missing girls, Alex. I loved the depth and the added layers that each perspective brought to the story. Any more than four POVs might have gotten too confusing to keep track of, but these four really came together to paint a full picture of what happened and to show how each piece fell into place. Alex’s perspective was particularly effective since we can witness firsthand the days and weeks leading up to the girls’ disappearance. All of these elements made for a well-paced read that I didn’t want to put down. Even though I enjoyed the story overall, I did have some mixed feelings about The Suspect, the first being that I found it hard to connect with Kate Waters. I experienced the same thing with the second book in the series. I like Kate well enough and I think she’s a talented journalist, but even three books in, I still just don’t feel like I really know much about her. In that sense, the books remind me of procedural crime dramas where the characters take a backseat to the crimes being investigated. There’s obviously nothing wrong with that and from a mystery standpoint, the story is fantastic, but because I prefer to feel some kind of a connection to the main characters, I found that aspect a little lacking in The Suspect. One other issue I had was that I felt like we learned what happened to the girls a little too soon. I know the book is called The Suspect and therefore implies that the suspect is the primary focus, but I just would have preferred a little more buildup to the reveal of the crime. 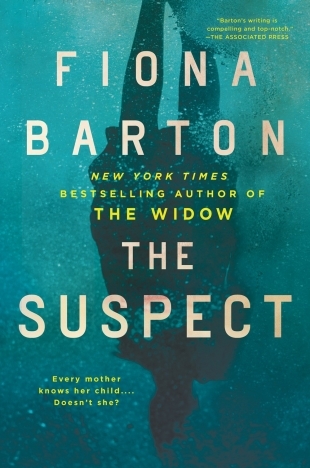 The Suspect is another riveting mystery from Fiona Barton. Even with the couple of issues I had with it, I still found the story very engaging and wouldn’t hesitate to recommend it to anyone looking for a good thriller. The new must-read standalone crime thriller from the author of Sunday Times bestseller, The Widow, and the Richard & Judy No. 1 bestseller, The Child – featuring unforgettable journalist, Kate Waters. The police belonged to another world – the world they saw on the television or in the papers. Not theirs. Journalist Kate Waters always does everything she can to be first to the story, first with the exclusive, first to discover the truth – and this time is no exception. But she can’t help but think of her own son, who she hasn’t seen in two years since he left home to go traveling. This time it’s personal. 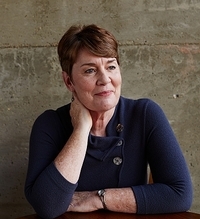 “My career has taken some surprising twists and turns over the years. I have been a journalist – senior writer at the Daily Mail, news editor at the Daily Telegraph, and chief reporter at The Mail on Sunday, where I won Reporter of the Year at the National Press Awards, gave up my job to volunteer in Sri Lanka and since 2008, have trained and worked with exiled and threatened journalists all over the world. The worm of my first book infected me long ago when, as a national newspaper journalist covering notorious crimes and trials, I found myself wondering what the wives of those accused really knew – or allowed themselves to know. Much to my astonishment and delight, The Widow was published in 36 countries and made the Sunday Times and New York Times Best Seller lists. It gave me the confidence to write a second book ,The Child, in which I return to another story that had intrigued me as a journalist. It begins with the discovery of a newborn’s skeleton on a building site. It only makes a paragraph in an evening newspaper but for three women it’s impossible to ignore.